Happy Thursday! Can you believe May is almost over!?! But at the same time I feel like every week is the last week in May..haha! I can’t seem to get my dates together! 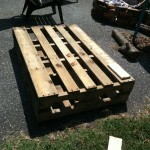 But what a fun way to culminate MAY with outdoor projects!! And sitting out on the porch is one of my favorite ways to relax. 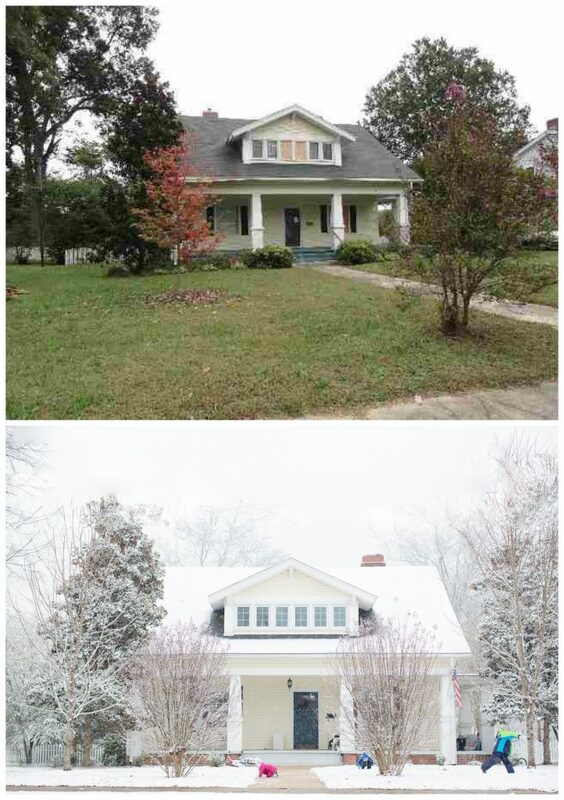 One of the things I loved most about this house when we walked by so many years ago was the porch. One day, we envision painting the ceiling that perfect blue and maybe even adding a railing but to know where we came from reminds us to take it slow. 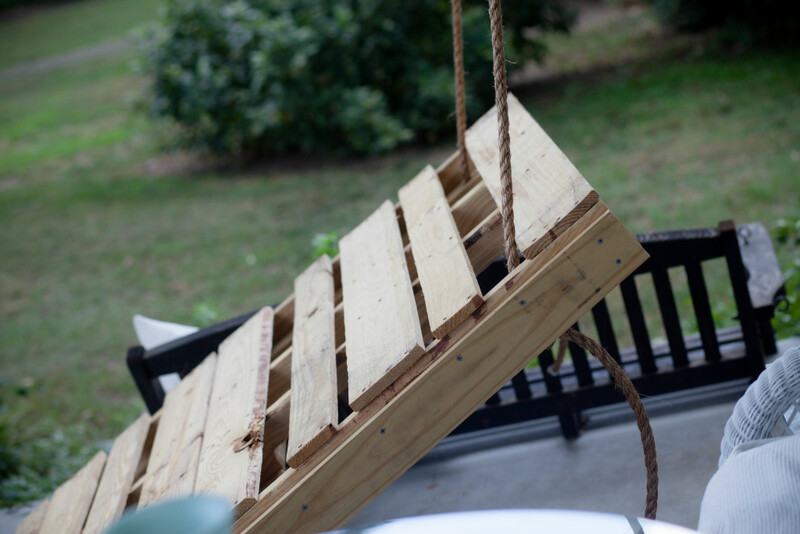 Since the deck is also slowly coming along and SINCE IT RAINS EVERYDAY in South Carolina, I wanted to share with you one of my very favorite projects….our DIY bed swing! I have to admit. 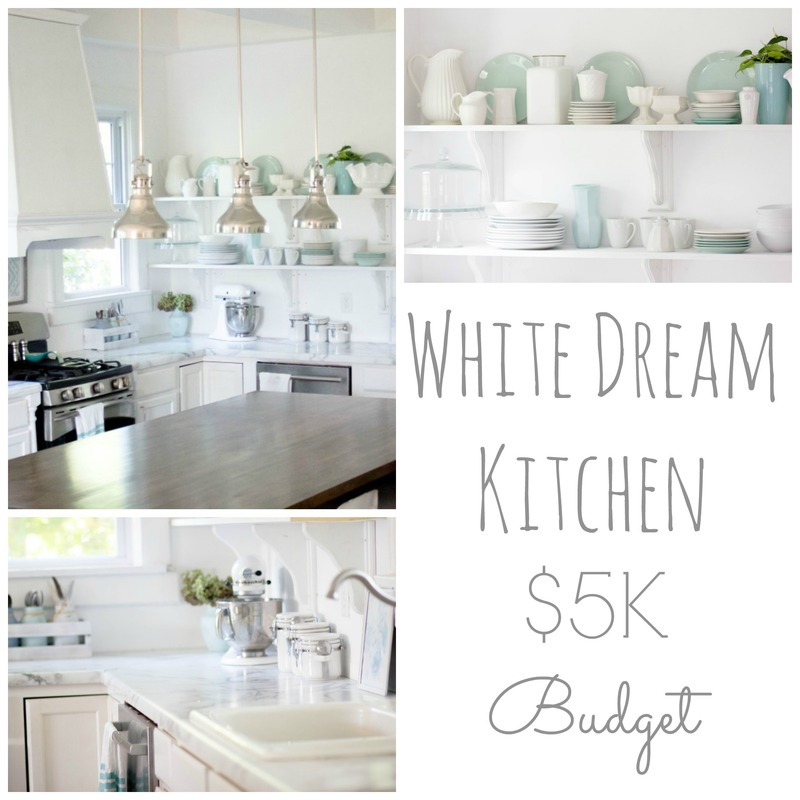 This project was super cheap for us because we had most of the supplies on hand. No, we aren’t hoarders but there was a porch swing already here so we reused those hooks, we had free pallets and we used leftover screws and wood from the treehouse! The only thing we had to buy was rope (and we had more than enough!). So our total was $17.40…not quite under $15 but I wanted to have more rope than we actually needed JUST in case. At 58 cents a foot, it’s EASILY doable under $15! 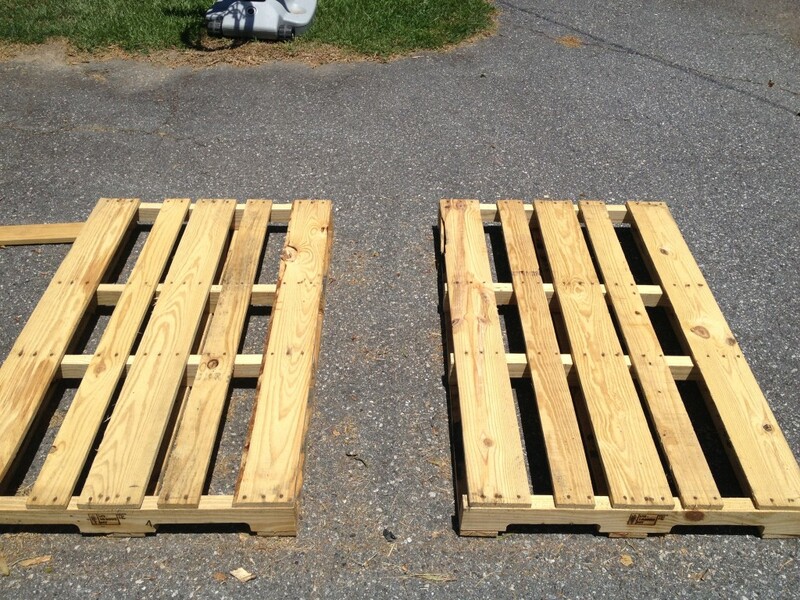 Russ took two pallets and joined them together with a 1×4. It’s up to you if you want to join them long ways. 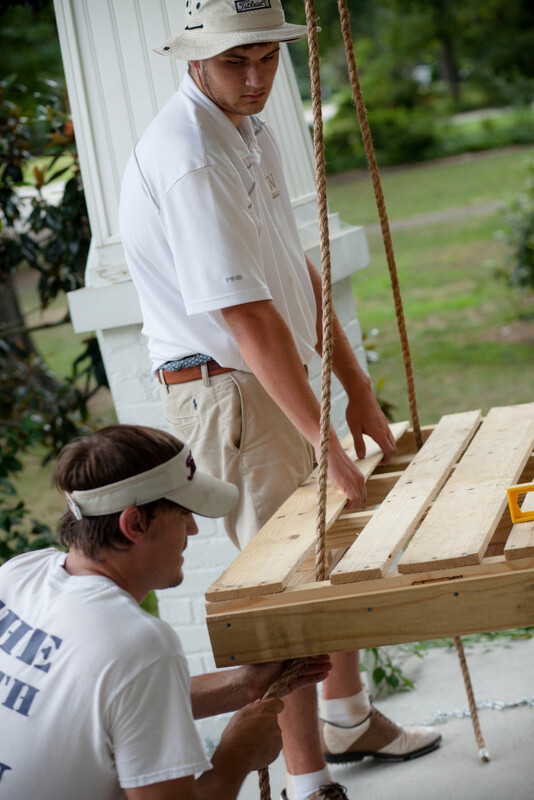 We wanted to use a crib mattress since this was for a porch swing. However, I am dreaming of one hanging from a tree in our backyard! 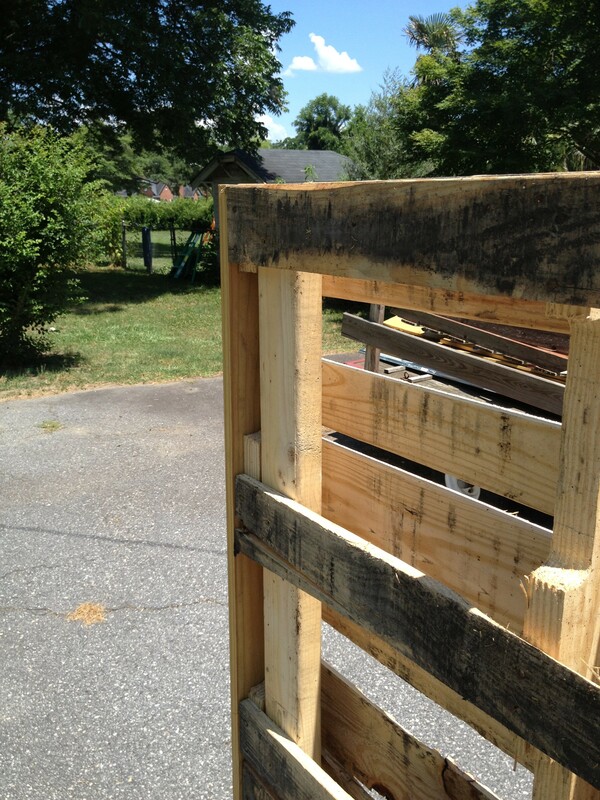 Next, he took a 2×4 to brace underneath. 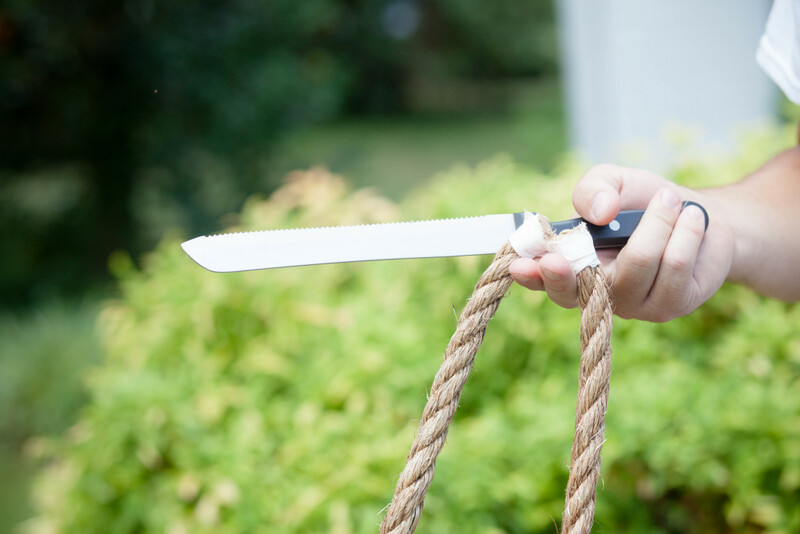 Then, using a hole saw he drilled two holes in the 2×4 for our rope to actually hold the swing. We bought 3/4″ thick rope (58 cents/foot) but y’all, we seriously had MORE than enough. This was the trickiest/easiest part (is there such a thing?). All you have to do is push the rope through the rung at the top. 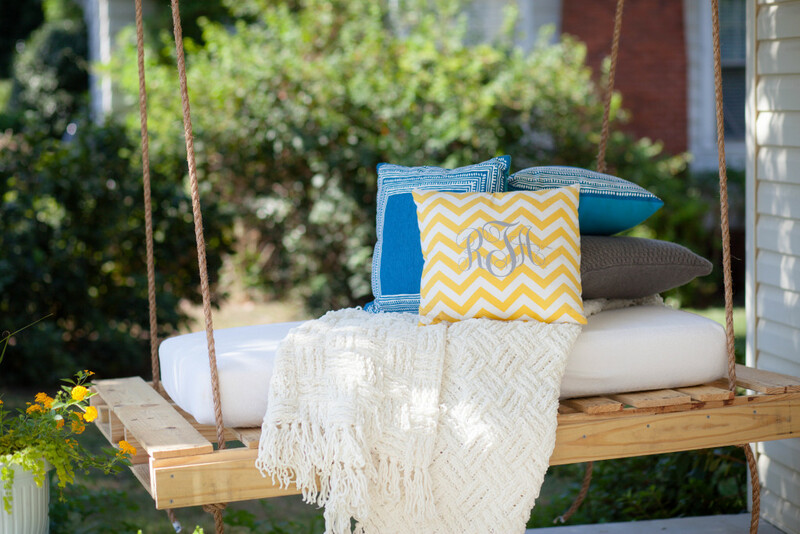 We used the brackets from our porch swing but you could easily find these at your home improvement store. 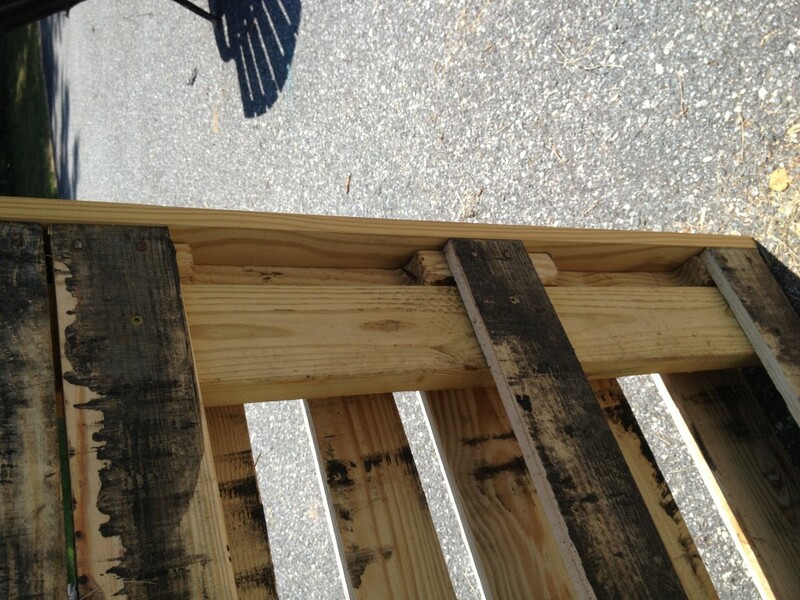 The guy at Lowe’s said to take some twine and tie at the top of these so it wouldn’t lean forward. BUT seeing as how Russ was out of town at the due date of this post, that part didn’t exactly happen. 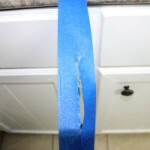 Also, to make cutting the rope easier, tape it! 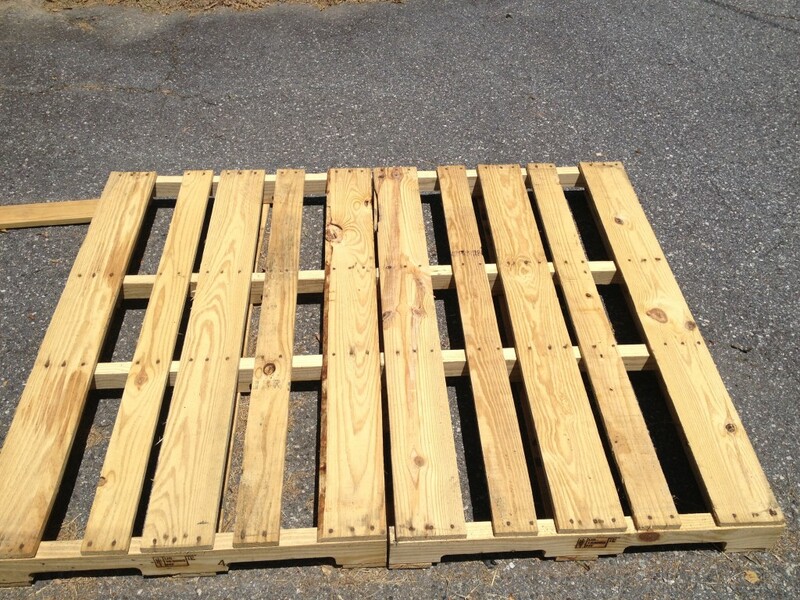 Last, find the nearest basketball player that happens to stop by to hold the pallet and hang it up! We double knotted it and I would like to fray the ends but again, time is of the essence and we are kind of short on it lately! What do you think? Doable for super cheap? 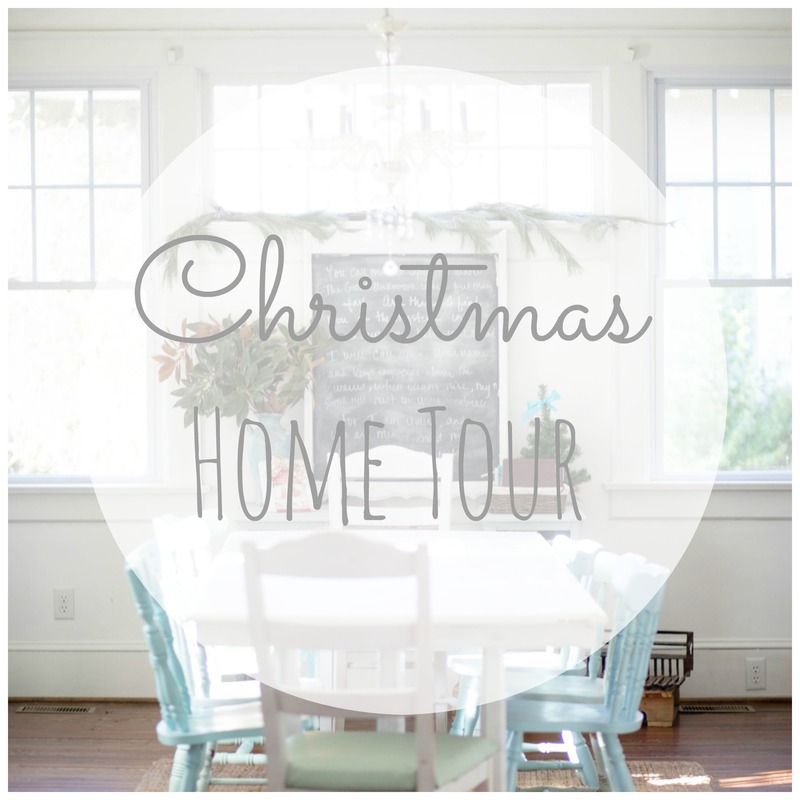 Now be sure to head over to see these AMAZING projects by my friends! 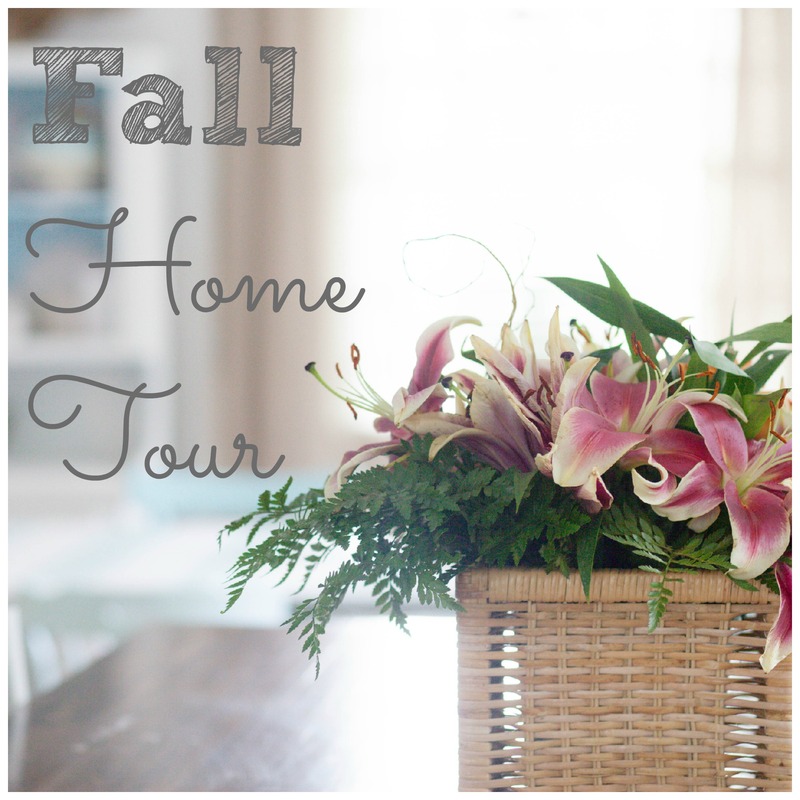 Thanks, again, to Shauna for hosting!! This is such a great swing! It goes perfect with your porch. I cannot believe it only cost $15! Well done. 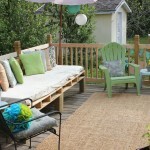 If only I had porch to do this with! 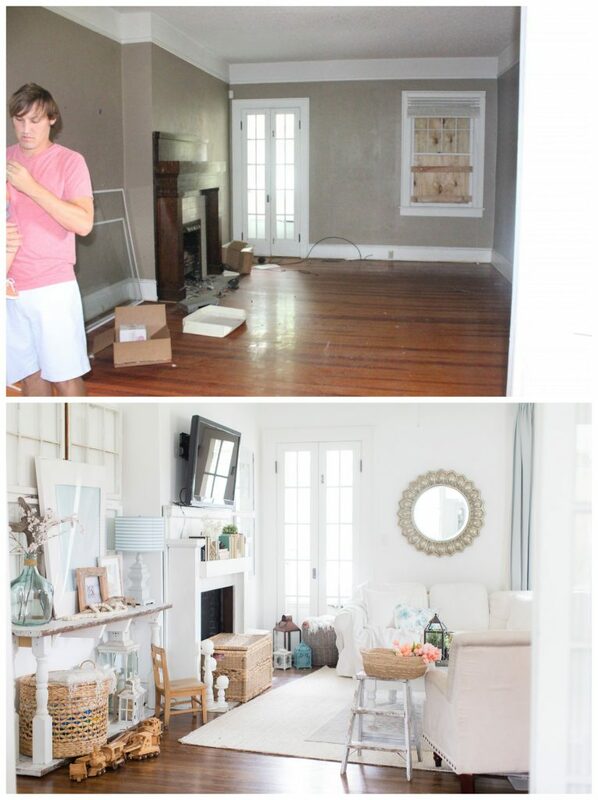 And the fan up top is perfection. Gorgeous! 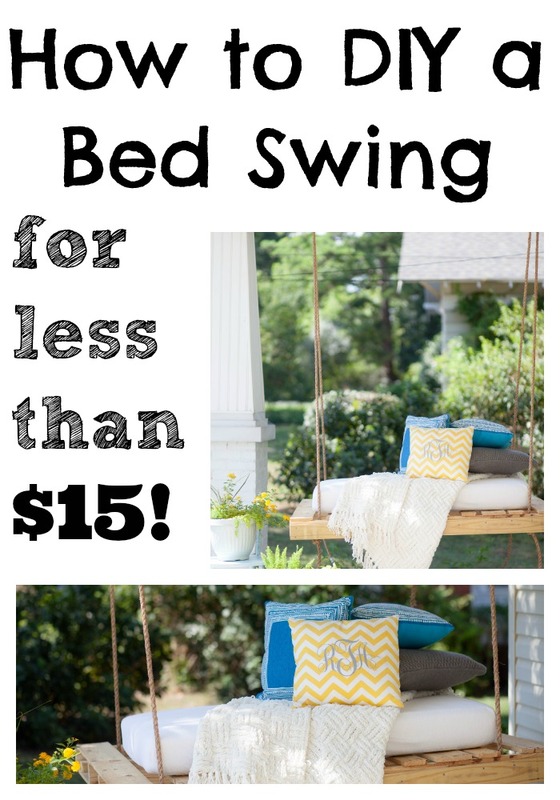 I would LOVE to have a hanging bed on my porch…and I love how inexpensive this is to make! What a fun idea! 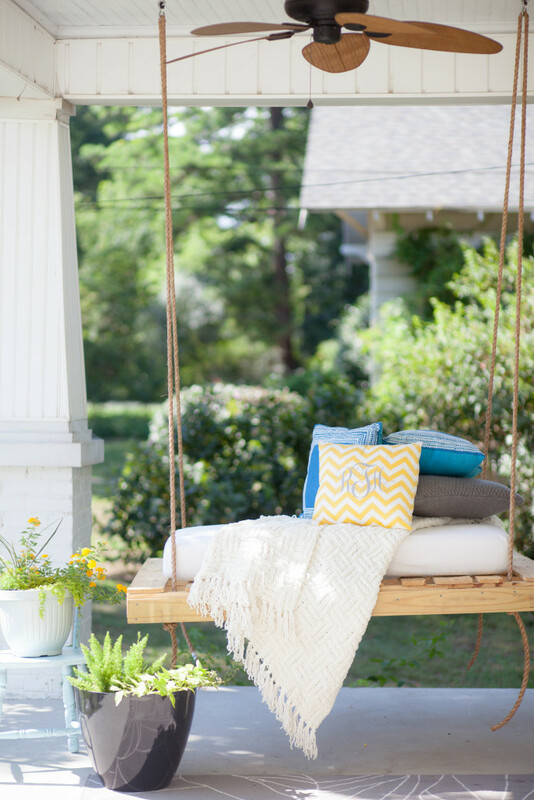 I LOVE your porch, perfect for a DIY hanging bed. Lovely!!! I’ve always wanted a hanging bed but we just don’t have anywhere that it would work on our patio. Enjoy!! Thank you!!! There are so many beautiful options everywhere! 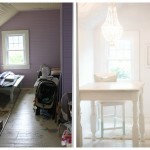 What a cute DIY Amber – my boys would love this. 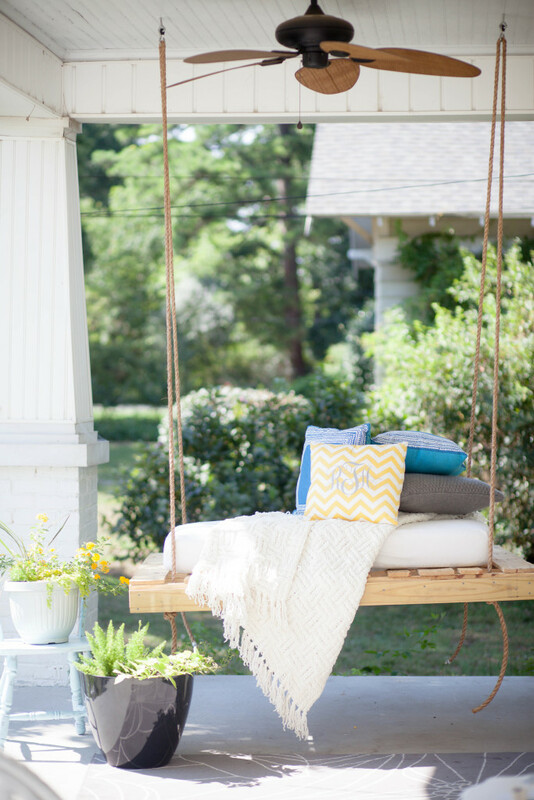 And it’s perfect for your porch! Oh my goodness! Such a comfy looking bed swing. I’d be here all afternoon. Beautiful! !